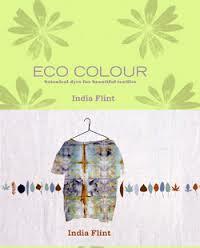 The second artist I am reviewing for this research point is India Flint, an Australian artist recognised world wide for her work on eco dyeing. The work of India Flint is very different to Michael Brennand-Wood. Where Michael uses bright colours and modern technology, India’s work is literally very organic as she specialises in natural or eco dyeing from found materials. The two artists both have works inspired by the natural world but with very different results. India’s work has a wonderfully messy quality to it, with smudged prints and patches of colour that almost appear unplanned and serendipitous. The appearance can be deceptive as the process of experimenting, wrapping, applying resists, mordanting and dyeing with natural materials is a science and takes careful planning to achieve required results. India describes herself as a botanical alchemist rather than a textile artist. Her interest in plants was cultivated at a young age when she spent time with her grandmother who dyed clothes using onionskins, tea and marigolds. 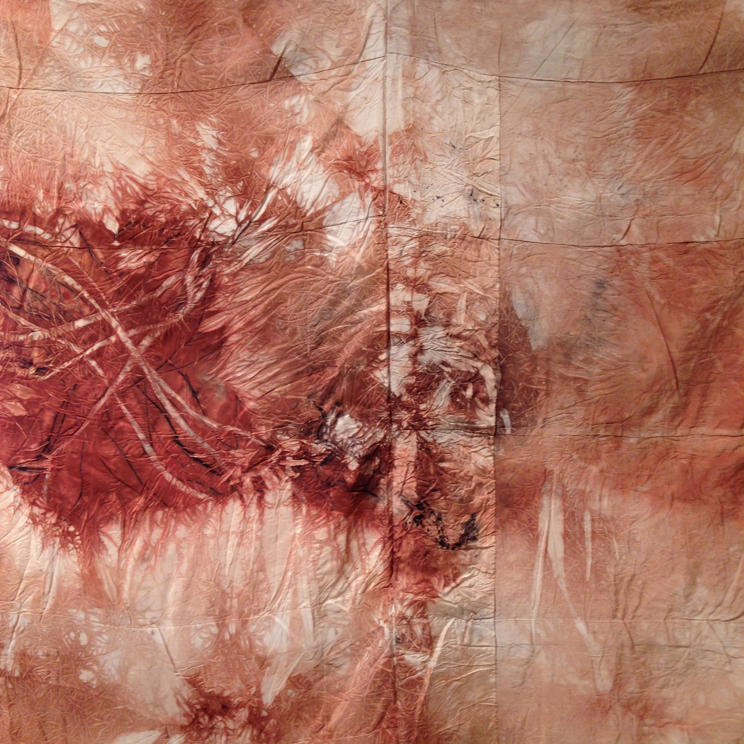 India worked with synthetic dyes in her textile work and then went completely to natural dyes for her MA in 2001. Every aspect of India’s work is natural, with natural mordants such as iron, urine and sea water rather than using synthetic mordants with natural dyes. It is also a slow process requiring patience and without quick results. On TAFA: The Textile and Fibre Art List, India says “The processes are slow and mindful, a kind of immersion in intimate knowledge of the land as much as quiet concentrated work on stitching and piecing”. One of India’s specialities is site specific work, with visits to an area, often remote, where she sets up a dye pot using the local materials – river water, fallen leaves and berries, pebbles etc. These works embody her beliefs in using natural materials and working with the earth to create works that are literally the embodiment of an area. This is a very detailed book with years of research distilled into the one publication. As well as a comprehensive listing of plants and berries that will produce specific colour ranges, there is a chapter on special effects which India uses so well in her work. 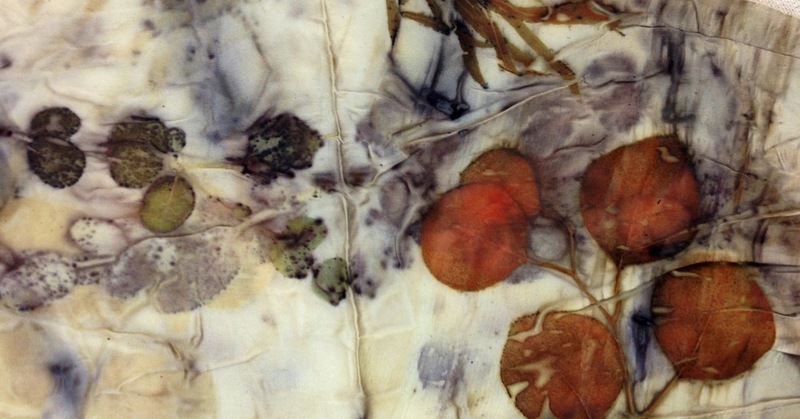 These include hot and cold bundling methods for eco-prints, marbling using onion skins, beating colour into cloth, shibori and layering techniques, using resists, solar dyeing and screen printing. The delights of using mud, cow pats and dirt are all explored. As with many books, I’ve had this one for a few years and haven’t tried any of the ideas in it so I decided to do a couple of experiments. I did some earth painting, using the wonderful red soil of the land up here (it’s a very particular dirt called Pindan which is widely found in North Western Australia). 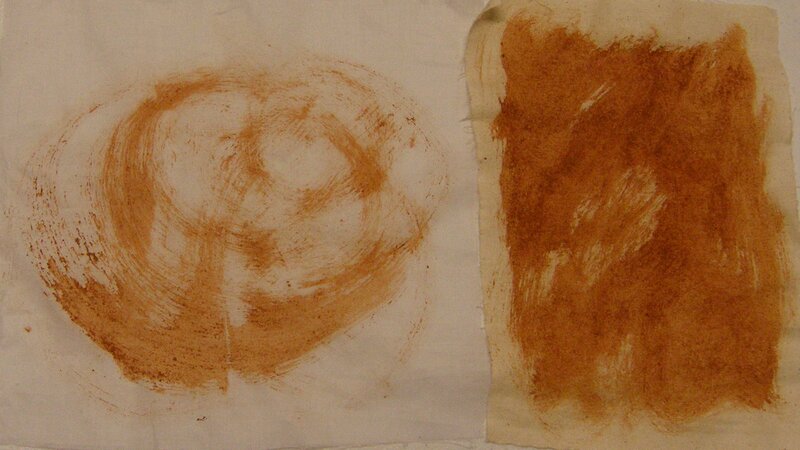 India recommends mixing the dirt with a little flour and some water to make a paste. I did this and then used a paint brush to do thick and thinner sweeps on calico. The result is a deep orange/red colour. The texture is a little rough and gritty. I know from experience that the colour is really fast on clothing! I used some Eucalyptus leaves to try bundling and steaming. I tested a number of small bundles on different silks, linen and calico, wrapping the leaves in the fabric and then steaming for half an hour as per the instructions. The results were disappointing as I only got vague hints of colour on the fabric and not the strong leaf impressions indicated in the book. The best sample was a long silk chiffon scarf which I unwrapped, then wrapped with more leaves and steamed a second time. You can just make out some leaf shapes but again it is not very clear. More experiments needed with this technique. The technique I had most success with was the hammering of leaves into cloth. I picked leaves from a couple of plants in the garden, folded calico fabric over then and hammered with a rubber mallet. 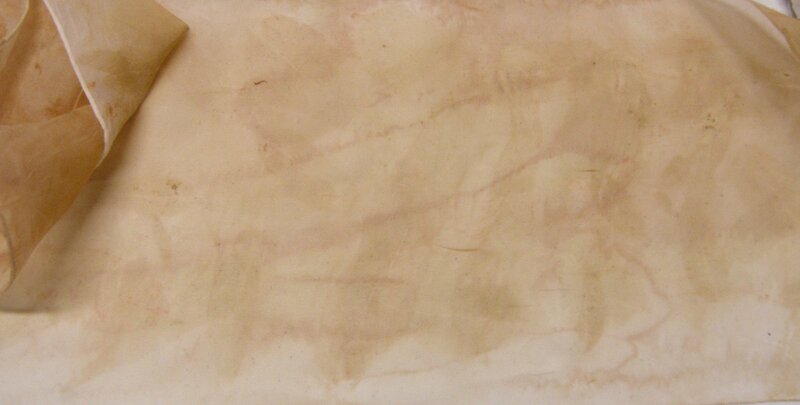 It took a lot of hammering but the results were really clear and good. I like India’s suggestion of using this technique on clothing, and then when it fades just hammering new prints on top so the clothing evolves and changes over time.